Heart Bandits is the national Eskimo rescue. Heart Bandits is also the rescue that stole two of my dogs Huka and Watsi. Watsi is prounced Watch-ee it means Watcher, protector, defender, he guards his little brother Huka with his life & soul, they are a bonded pair & after everything that they’ve been through in thier short lives the last thing they need is to have the other ripped away from them Huka is the little guy in the back, his name in Lakota means “I am not afraid” but he is sometimes very afraid so he hides behind his big brother Watsi (Watchee) When we got Huka he was at death’s door, I had to give him IV fluids & fluids under his skin & give him regular baths to bring his body temp down & Watsi NEVER left his side, I made the mistake of closing the bathroom door once & he sat outside the door screaming & had real tears coming out of his eyes, not once did he leave his side, even at feeding time he would grab a mouthful of food & bring it back to Huka;s side & he wouldn’t even leave long enough to get water so I had to bring it to him. All of these guys have such incredible little souls but those two are stand outs. No I will not separate them. So as you may have guessed I don’t have much love loss for them at all. Now as some of you know I actually started working with them again because of a man there named Michael Thurber, he ended up taking Reynolds the Kennewick Eskimo that was returned to me, and then it was found out that he had issues with his eyes. So he then started a fundraiser which netted $3585. Reynolds ended up going to one of the best homes he could possibly have gotten and I thought everything was fine. Well come to find out it wasn’t fine. The new owners got stuck with the entire bill for 3300.00 for the doctors. Now at first when I heard vague rumors, I didn’t believe them and I came straight to Michael’s defense, he could do nothing wrong in my eyes. Then I found out who it was about and what it was about. So you know me then I have to start investigating, it turns out that Michael Thurber has had 4 different fundraising events for dogs just in the past few months totaling $6346. I myself donated 150.00 to Reynolds care. I know the foster home that he went to and I know they’re not going to make up anything, and right now the husband is very ill and I don’t think that $3300 on your credit card is a good thing. I don’t really think they can afford that right now. So again where did the money go? What about this other money? I started asking questions. All I got was more confused. Please note that in this last fundrazr screen capture the lady is who saying he has nothing to do with HB is commenting as well. Perhaps the most confusing part was the Heart Bandits reaction to the situation. Instead of doing damage control basically what they did is throw Mr. Thurber under the bus saying that he is not a representative and he is not authorized take money. There was an earlier posting that said he is no longer able to take money but I don’t know where that went. You guessed it! The national rescue director. WTH? So that gets me to thinking some more and that’s always dangerous, maybe just for me but it’s still dangerous. I start investigating a little bit more and I find out that their main server there IP domain is registered to him with a California address. During the fundraising for Reynolds there were several posts that if you didn’t use PayPal you could send a check to an address in California presumably Heart Bandit’s address so the fundraiser showed that there was this amount of money that was raised, plus there were checks that were being sent so instead of Heart Bandit saying to the foster/adoptive parents “Hey we got this much checks we’re going to send them to you right away” all they’re doing is blaming and trying to play hot potato with with who is the national rescue director. Uh oh WAIT A MINUTE! Right up above they are directing you to call Michael for credit card donations but checks you can send to them. So instead of simply saying there was an issue with accounting & that they were working quietly to fix the problem, taking the foster parents to the side (yes there is more then 1 set of foster parents who did not get reimbursed) & trying to work things out. They turned this into a bash Michael campaign. A virtual “It wasn’t me” fest. Worse yet: whether it is true or not remains to be seen but the folks from Facebook were telling another rescuer that he was talking trash about them: The problem with that is the rescuer in question: Talking bad about her or bad mouthing her is like trash talking the Pope! No one with 1/2 a brain cell would believe anything bad about her. So in essence we have no answers, there is no clue where the money went, & no one is taking accountablilty for anything yet. For all we know they may have gotten the money, & only God (& them) knows how much they took in via checks & credit card payments. I recently had a volunteer steal from me, instead of saying oh it was all her fault cause she was a bad bad lady, I told the folks who were impacted, let them know what happened, I got everyone’s items to them & reimbursed the other people ~myself~ no problem, it was my fault for trusting her & I made it right with the people who were affected. That is just good business. Oddly enough it also seemed to have foster a greater climate of trust with those people which I am eternally grateful for. So when is Heart Bandits going to cough up the Foster’s monies? I don’t know. Where did all the other money go? They are not saying. What they are saying is just enough to infer that Michael is a thief without actually saying it. I have seen the way they operate, I know how sneaky & shady they are. At this point I’d say if you are going to donate to Heart Bandits ONLY donate to that specific Chapter/Rescue so that they can continue their good works & I would also venture to say that before you go on a bashing campaign against Mr Thurber that you DEMAND some answers & facts for yourself. I have this bad feeling in my stomach about this whole thing & I can promise you it is not what it seems to be. I will keep you updated if I learn any new true facts, at this point is is just a bunch of fingers pointing. I do have a suggestion for HB though. I had the world’s best volunteer named Angel Merritt, when I was having the hardest time while HB, Sherry Meyers (Wa HB Chapter) & Teri Cole were all going on the attack at me, honestly SHE should’ve been running my rescue, she is now down at the Ca HB, if they have a lick of sense they will hand everything over to her, let her straighten it out & streamline it. She is the one who wrote my adoption application & contract that we still use to this day. She also has a heart & doesn’t get into the politics. If it wasn’t for Michael I would’ve had nothing to do with HB at all, if it wasn’t for Michael I also would’ve sued the California chapter for the round about theft of my two dogs. If it wasn’t for Michael Reynolds wouldn’t be with his new family… a lot of people have a lot of things to be thankful to him for. A lot of dogs too. I hope that the light at the end of the tunnel is a good outcome for all of the parties involved & that is all just some accounting or communication snafu. Michael has been nothing but kind to me so I am not unbiased. you need to ask your self, what happened to the money that Michael took in thru paypal. Is he so innocent not to be thrown under a bus? Obiously the money didnt get to the dog that need it and then you need to ask those that money was raised for the others in your screen shots if they got that money. Michael was a driving force in getting money, did anyone ever get the money for the dogs? or were they left holding the bag? He also had the additude that he was the only good person that could save a dog causing confusion with people if the dogs were going to be saved or not, how many dogs died because of this. there is smoke there is fire. I have never gotten the impression in dealing with him that he thought he was the “only” one who could save dogs but someone else may have. At this point no one’s feelings or thoughts should be ignored or criticized because we don’t have any real answers or truths yet. I was seriously alarmed when they came out & said that he was not the rescue director, when it is a well known fact that he is & has been, & saying he has nothing to do with the rescue & is not allowed to take funds… but what really freaked me out was his response: He simply said that he was sorry it had to be this way. That is all, most thieves & scheisters will scream to the world “It wasn’t me, I was framed, I am innocent” he did none of that. My biggest fear is that because they took this to a public forum that it is going to reflect badly on the other chapters who are innocent & all of those other chapters are good caring honest & kind people. I know for a FACT that they use any money they get wisely & for the dogs. 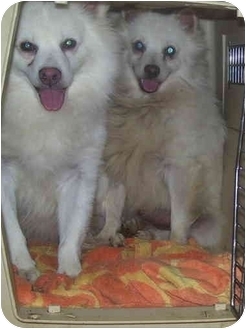 I am wondering if I am one of the two fosters left holding a vetting bill for an Eskie that Michael Thurber, as National Rescue Coordinator of HB, authorized me to pull and vet. If not, count me as a third. I’m sure there are many more, though I do second your questions of the accounting practices of HB. I ran the NYC Metro area chapter for a while prior to moving out of state (twice lol) and went bankrupt because of the way they ran things financially. I have heard they have restructured things, but maybe not enough. I hope that everyone can see through the kneejerk reactions to get to the heart of the matter: Donated funds & what has happened to them & WHO was responsible. When we had a volunteer steal from us, it was only a small amount of cash that was in a money order, & jewelery that was supposed to go to people from an auction. We got the money back & I notified the folks who got the auction items that I had retrieved their items with the help of the police. Even if we wouldn’t have gotten the items back I would’ve immediately refunded their money but I know they were grateful that I was honest, open & kept them informed. I also did not try to shirk responsibility about it, the money & it the money & items were my responsibility NOT theirs. Legally they are responsible for every dime not paid out or accounted for & the corporate officer’s personal property can be attached if it came down to any type of lawsuit. I filed a complaint regarding the FundRazr that Michael Thurber ran for Reynolds. Upon inspection, they found 4 different campaigns that Michael ran,and it appears that none of the intended people received their funds and PayPal had blocked his account due to all the requested refunds. In addition, FundRazr has blocked his account (email, and FB) so he may no longer use their site to scam folks. Michael has had more than enough time to resolve this problem, as the funds were in his name in Paypal, but has chosen not to do so for whatever reason. At this point, the people who were expecting the $$$ need to contact their local law enforcement in order to have Michael prosecuted if only to ensure he doesn’t continue to do this to other people. This appears to be a con on his part, and it’s across state lines, so he’s going to be looking at a Federal offense/charges at some point. If you donated to one of the campaigns used in Michael’s scams, then contact PayPal, or if you used a Credit Card, then contact your Credit Card company ASAP. I don’t know Michael, but there’s some very good people with very kind hearts that he left holding some fairly large bills. If you did not open a dispute on a transaction within 45 days, you aren’t covered by PayPal Purchase Protection. However, you can still file a report online through the Internet Crime Complaint Center, or IC3. The IC3 was established as a partnership between the Federal Bureau of Investigation (FBI) and the National White Collar Crime Center (NW3C) to serve as a means to receive Internet related criminal complaints. You can file a complaint with the IC3 at http://www.ic3.gov. To learn more about PayPal’s Buyer Protection Policy, go to http://www.paypal.com and click “Security and Protection” at the top of the page.